Really, whoever you are, and however impeccable your credentials, if you're going to call yourself Soft Machine you have o damn well deliver the goods. I'm happy to report that, with the combined service of about 150 years, on Hidden Details the current quartet is not only keeping the name going, but is also adding to the impressive legacy. Whether it's the resounding ambient 'Broken Hill' backing John Etheridge's probing guitar explorations, John Marshall's urgent percussive flurries, or Theo Travis's incisive reeds and flute, this has all the hallmarks of Canterbury jazz-rock restlessly muscling towards the second quarter of the 21st century. Not forgetting, of course, Roy Babbington's loose-limbed bass that both anchors and destabilises the evolving melodies, nowhere more so than on the title track. And then there's 'Out Bloody Rageous (Part 1)' making a return to the studio, still as fresh as ever, splashing primary colours across that irresistible rhythm - less a nod to the past than a continuation of the same nod, a big smile plastered across its face. 2018's Softs aren't resting on their laurels, they're rearranging them and sticking them on the head of that pompous-looking statue in the town centre. Great stuff! Soft Machine, Hidden Details, "Jazz Album Choice" in November's Hi Fi News & Record Review. Friday 28th September. Reviewed by Steve Harris. Soft Machine went through many incarnations between their inception in 1966 and a last gig at Ronnie Scott's in '84, by which time all the original members had long since left. The current quartet, known until 2015 as Soft Machine Legacy, includes three who'd been members of the band in the '70s. Drummer John Marshall replaced Robert Wyatt in 1971, bassist Roy Babbington joined in 1973 and guitarist John Etheridge in '76. But reeds and keyboards player Theo Travis came into the Legacy project after the death of Elton Dean in 2006. Most pieces here are new, with some great playing, but there are are vibrant reworkings of 'The Man Who Waved At Trains' and 'Out Bloody Rageous'. A milestone. What always set Soft Machine apart from the general run of jazz rock was its humane embrace of sentiment and humour. Where most jazz rock groups were a bit Top Gear , all sneering masculine irony when they weren't being out and out pretentious, The Softs were a bit like a noisy school outing, the clever boys always being shouted down by the rougher kids, no one quite in control, no one quite going over the top other. You might admire Gilgamesh or later Nucleus or Back Door, but you were fond of Soft Machine. With Hidden Details you're being asked not so much to turn back the clock as to accept that these guys have aged but not gone all nostalgic and serious. Etheridge gets an acoustic feature on "Heart Off Guard" (a perfect Soft Machine title) and then again on the following "Broken Hill"; as well he might, since it's his record label. Etheridge is often caricatured as a bit of a pastoralist. He's actually quite a ferocious player when the mood takes him, and it takes him quite often; "Life On Bridges" is a further example. As ever, the sound is crisp, light without being over-bright, and effortlessly democratic. It's at its very best on the utterly delightful "Fourteen Hour Dream" which comes almost at the finish, but just in time to confirm that this isn't a nostalgia or revival band but a very vital unit, contemporary and alert, consistently humane, still capable of surprise and delight. Hidden Details is, as Soft Machine largely was, a thoroughly egalitarian affair, though Travis and Etheridge are the group's primary composers. Etheridge's "Drifting White" may run less than two minutes in length, but its blend of single note melodies and supportive chord work demonstrate just how far the guitarist has come since the days of Softs, when it was more decidedly about light-speed chops. With music ranging from complete freedom and interpretive openness to more defined structures, Hidden Details manages to evoke not just the spirit of any one Soft Machine lineup of the past, but of many, while collecting its multiple touchstones into something wholly distinctive...in itself, a description absolutely essential to any Soft Machine lineup. Etheridge combines the rapid-fire skill that made him such a powerful addition to Softs with an of attention to space and, in this case, visceral, whammy bar-driven lines that reflect years of maturity and experience gained. The legendary psychedelic/jazz-rock band Soft Machine celebrate 50 years with three early members (including guitarist John Etheridge) plus fine saxist Theo Travis on Hidden Details – a fitting fusion of guitar wailing, dreamy flute work, spacey electronics, edgy sax improv and dancing, Zappa-like melodies. Soft Machine, Hidden Details, Dyad ****. Friday 31st August. Reviewed by John Bungey of The Times. Since 1968 the band name Soft Machine has meant all sorts of things to all sorts of people. First came the psychedelic pranksters who vied with the Pink Floyd as freak-out favourites in underground London. As hip as hash cakes but unable to actually sell records, they made the farthest-out noises on John Peel’s Top Gear show. The quartet also became the first “pop” band to play the Proms (and were briefly managed by Damon Albarn’s dad). There have been some partial reunions (Soft Works, Soft Ware, Legacy) but now, 37 years since the last studio LP, the Soft Machine name has been fully resurrected by four very credible veterans from the myriad who served under the band’s flag. Hidden Details features John Etheridge, guitar, Theo Travis, sax and flute, Roy Babbington, bass, and John Marshall, drums. It’s a robust and engaging set that, incidentally, the bots at Amazon have filed under “rock”. That’s probably down to the muscular stomp of the opening title track, which features from Etheridge the sort of fret-melting guitar solo not heard since Frank Zappa’s Shut Up ’n Play Yer Guitar. The band, of course, has a broader palette — from Metheny-like jazz-rock to anything-goes improvisation; from pastoral passages with Etheridge on acoustic to an ambient flutescape from Travis. Compact and to the point, nothing overstays its welcome. There are faithful versions of two old favourites — Out Bloody Rageous and The Man Who Waved at Trains. That they sit well amid the new material suggest that this is a band looking back as much as forwards. That’s hardly surprising when three quarters of the members are in their seventies (although you wouldn’t guess from the rhythmic clout). The quartet are on tour, playing British dates in November. Welcome back, gents. Vimala Rowe, John Etheridge, Out of the Sky, Dyad **** Friday 29th April. Review by Stephen Graham. The words 'Blue' and 'breeze', a long exhalation, a mood instantly captured, the bluesy moan of voice and hum of guitar. Out of the Sky is an album of nine tracks that frames stark themes, originals and arranged treatments of traditional African music and jazz standards as a unity. A cinematic version of an Aramaic prayer draws together the ancient culture and modern sufferings of Syria and a harrowing version of Ellington's 'Solitude' are tracks for replaying most. Largely duets (the double bass of Dudley Phillips pops up on two tracks) the wiry sometimes desert-distant Ry Cooder-like earthy quality of the veteran Soft Machine guitarist is a calm held in reserve, a landmark sound that the heart-on-sleeve carefully calibrated passion of Rowe leans in to. The singer, who can swoop to gather up meaningful undertones, manipulating the silences, or reach high to scrape off glassy accented shards raw with expressive powerful resource, and Etheridge from their first meeting walking on Hampstead Heath have clearly bonded on this persuasive studio album recorded last summer, the majestic stillness the pair create on a moving appropriately angelic version of Kenyan singer Fadhili William's 'Malaika' famously covered by Miriam Makeba where Rowe inescapably and elsewhere on the album is reminiscent of Sibongile Khumalo and she stands comparison with the best role models, remarkably complete for such a relative newcomer. Jazz singer discovery of 2016 so far? You bet. The album moves to a vintage climax with the more familiar Bird beloved 'Dark Shadows', and a version of 'Detour Ahead' a song that goes back to Woody Herman days (there is also a fine early version of the song by cult favourite Jackie Paris on YouTube), the only new coordinates required simply ones that involve a journey of the imagination. CD Review: Vimala Rowe/John Etheridge - Out of the Sky Friday 29th April. Review by Lance of Bebop Spoken Here. Those who attended the Cafe Society Swing show at GIJF 2016 came away with their head in the clouds. This was one outstanding event - for me the highlight! It was maybe the first time most of us had encountered Vimala Rowe and, just as we'd been hit for six when we first heard Cecile McLorin Salvant at Whitley Bay a few years back, Vimala Rowe also hit a few that didn't touch the ground! We wanted more, and now we've got it - or have we? I'd say we've got it even though this is far removed from the Billie/Sarah/Lena persona that prevailed in Sage Two at GIJF. In John Etheridge, Vimala has found the musical soulmate to take her in a different direction (or maybe vice versa!). The pair gel beautifully on an amazingly varied programme. An emotive Solitude, Earl Coleman's Dark Shadows, an African piece sung in Swahili, classical Indian compositions, several originals by Rowe and the jazz standard Detour Ahead. Very apt as the duo, assisted by Dudley Phillips on double bass on a couple of tracks, take many detours from the straight and narrow - there's even a suggestion of flamenco along the way. If I'm totally honest, it didn't jump up and hit me between the eyes first time round but, after repeated playings, it got through to me that this really is something special. Two artists at the top of their game merging as one. John Etheridge and Vimala Rowe Duo 26th February 2016. Review by Jim Whitman. Jazz as we know it today could hardly be more encompassing, yet guitar/vocal duos are a rarity. Even the few recordings that Ella Fitzgerald made with Joe Pass are not well known. The reasons aren't difficult to appreciate: both singer and guitarist must have the capacity to perform compellingly while highly exposed; their styles need to be complementary and their coordination superb; and they need to be able to connect to audiences directly and consistently, without resort to any instrumental or extended tonal variety. At their best, they deliver the listener to the very heart of a song. But the performance that John Etheridge and Vimala Rowe gave us was that and more: this was a 'home delivery' - that is, straight to the hearts of the audience. It's not unusual for audiences to feel exhilarated and thrilled, but on this occasion, we were left weak-kneed and speechless. John Etheridge has played top-level guitar in a striking array of contexts and styles. There can't be much in the way of high-level guitar playing for which he isn't the gold standard. The weight and span of his experience was on full display, as was his artistry: his support of Vimala Rowe was precise and attentive as well as expressive; and his solo passages were a show on their own: creative and distinctive, but always apt, beautifully crafted to the nature of the songs. Vimala Rowe is a revelation-a truly individual singer, who is in full possession of the whole parcel of gifts: magnetic stage presence; a voice with strength and character throughout her range; and very finely judged use of her extensive vocal technique (vibrato; wonderful, deep notes; long, pure-toned sustains; and of course, the dizzy heights.) The word 'soulful' is often bandied about, but this was the real thing. And for all of the variety of material (including a few of Vimala Rowe's own compositions), the sheer verve, consistency and sure-footed performing joy these two exuded made both sets a seamless delight. There's only one response to music-making as engaging and moving as this: 'Play all night!' Would that they had. No one would have budged. Like many top jazzmen, John Etheridge has spent his life alternating between low-key gigs with journeyman musicians, and high-profile concerts with international stars. His stature is recognised by the Pizza Express Jazz Club with an annual residency, and this year's six-night season at the Dean Street club reflects his enormous versatility. It features performances with the Zappatistas, the Blue Spirits Trio and two appearances with the Soft Machine Legacy. John Etheridge's association with Nigel Kennedy dates back around 30 years, when they met through Stéphane Grappelli (with whom Etheridge was touring); later they joined forces in the younger violinist's group in 1992. Although their relationship has been rekindled sporadically since then - including a couple of recordings - this was a rare opportunity to see them play together in a small venue. The first of their two shows began acoustically with Da Blues, accompanied by Yaron Stavi on double bass and Mark Fletcher on drums. Django Reinhardt's tunes Swing 39 and Nuages were played with a restraint that contrasted with the passionate Melody In The Wind, but the highlights of the first set were Kennedy's sublime Fallen Forest, and Etheridge's I Saw You Passing By. Some of the finest moments came during Etheridge's solos which were accompanied by Kennedy playing pizzicato quasi guitara. An exciting finish to the set was assured with It Don't Mean A Thing (If It Ain't Got That Swing). Nigel Kennedy resisted the temptation to say anything about football; but the concert was a game of two halves. One sensed the loyalties of the crowd dividing when it was announced that the second set would be played "electric". The great violinist eased into it with a piece of unaccompanied (and acoustic) Bach; then the electric instruments came out for a raging So What, during which he awkwardly quoted Strangers in the Night. An understated Mood Indigo might have fitted more comfortably into the first set but there was no question that what followed was eagerly anticipated by many punters. Jimi Hendrix's Little Wing was given a high volume and lengthy workout. Few people have the knack of upping the ante like Kennedy, and here he flew into an utterly stupendous middle section, letting rip with such gusto that even the most staid members of the audience became animated. Etheridge was grimacing with effort and beaming with satisfaction. Both principals are clearly fans of Hendrix, so after the last "jazz" piece, Perdido, it was no surprise that Purple Haze was chosen for the grand finale. It contained another Strangers in the Night quotation (perhaps an oblique reference to the reunion) and ended to tumultuous applause with the familiar pounding riff of Deep Purple's Smoke on the Water. Kennedy's presence was responsible for the high ticket price (and perhaps also the sell-out audience), although he and Etheridge shared the spotlight and were equal partners throughout the performance. Yaron Stavi and Mark Fletcher received little solo space, but were working very hard throughout. Overall, the gig wouldn't quite gain a "blissful" rating, but it was packed with drama and excitement. A man at the front punched the air, swayed, and loudly brayed "Yeah!" or "Oh My God!" at virtually every phrase. Many of us were echoing his joy and appreciation - while managing to do it rather less intrusively. 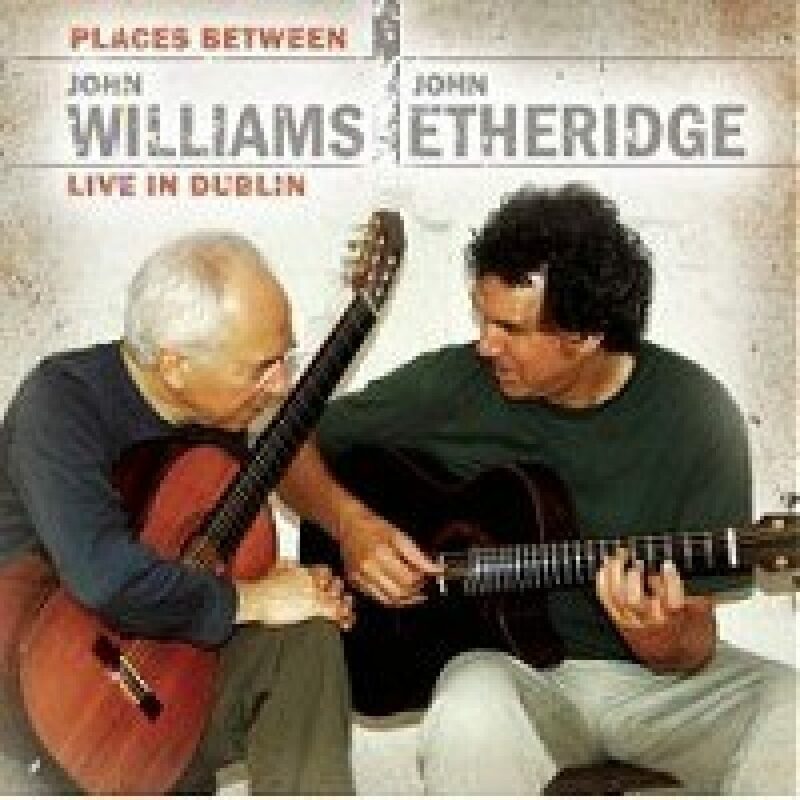 John Williams & John Etheridge - Places Between: Live in Dublin. Sony Classical 88697009072 Meetings between classical and jazz musicians have a habit of slipping between two stools. But John Williams is not your typical, staid recitalist, and John Etheridge is on a purple streak at the moment (he has also just released some restful duets with the violinist Christian Garrick), so the results of this guitar encounter are special. The programme is a superbly poised mixture of influences, from West African dance rhythms to Django-esque swing and delicate elaborations on baroque themes. When Etheridge switches to electric guitar, his playing is no less subtle. And not a dull crossover anthem in sight. Clive Davis - The Times. Williams/Etheridge. 'Together' and solo Australian tour. Mark Coughln - Australian. Magic in the hands of masters. Their playing was deeply impressive and both musicians navigated their instruments with effortless brilliance and control..
Etheridge/Williams. Pizza Express, London John L Walters - Guardian Review Pages When guitarist John Etheridge settles down for a residency at Pizza Express, he rarely takes the easy route. This time he's appearing with four different line-ups over seven days. But Etheridge is a musician who can play everything from acid rock to gypsy swing - sometimes in the space of one solo - so playing world, classical, jazz, prog (in the Soft Machine Legacy) and the great American songbook in one week must be a doddle. The first two days were given over to a pairing with classical guitarist John Williams, drawing upon the eclectic repertoire featured on their album Places Between. Etheridge played jazz and blues standards, including Lullaby of Birdland and Stormy Weather, and Williams played exquisite classical vignet! tes: El Totumo, from Venezuela, and a Satie-like adaptation of an untitled tune by a friend. The duo pieces made the most of their contrasting approaches: in Monti's Casino, it was fascinating to hear how well Williams's straighter, crisper parts meshed with Etheridge's natural swing. Malinke Guitars, Williams's adaptation of three Malian tunes, had a churning groove that refracted the African motifs into something resembling Spanish-tinged minimalism. Williams is that rare thing, a "serious" musician who delights in playing within non-classical contexts without compromising his roots. They concluded with Djanjon, a west African piece that, in Williams's words, has "no beginning, no end, it just is . . . we just start somewhere and end it somewhere else". Etheridge said with a grin: "That's a bit deep!" John Etheridge Pizza Express Jazz Club, W1. Clive Davis. The Times Some guitarists see a solo recital as the pretext for endless displays of mercurial fingerwork. No chord substitution left unturned, and all that. It’s a measure of John Etheridge’s talent that a fair proportion of his opening set was devoted to unpretentious, globe-trotting themes that other jazz musicians might have felt slightly beneath their dignity. Etheridge’s gentle cross-rhythms imbued them with genuine dignity. Few of his peers handle an electric instrument with such delicacy. He combines a jazzman’s sophistication with a folksy sense of drama. While Pat Metheny may have more harmonic colour in his palette, the Englishman’s penchant for simple, unaffected melodic lines makes him ideal company in a venue as intimate as this. The lilting, circular phrases in the opening sequence found him paying homage to his fellow guitarist the late Francis Bebey, a dominant figure in modern Cameroonian music. Even without the help of a percussion section, Etheridge had no difficulty at all in generating a seductive dance pulse. In more reflective vein, he sketched serene lines across Richard Thompson’s The Dimming of the Day, and the programme took a more orthodox, boppish turn with a medium-tempo version of Sonny Rollins’s Doxy, underpinned by a sultry walking bass line. An eagerly awaited series of acoustic duets with John Williams did not disappoint, unless anyone was expecting virtuoso one-upmanship. Instead the two players — who had previously joined forces on Williams’s album The Magic Box — settled into a restful waltz from Cape Verde. Later, a performance of traditional griot songs — originally written for the kora — demonstrated just how much the pair could glean from the starkest of chords. After a reunion with members of Soft Machine, Etheridge will be in introspective mood again at the end of his season on Sunday when he teams up with that superb violinist Christian Garrick. John Etheridge with John Williams Pizza Express Jazz Club, London Sholto Byrnes. The Independent John Etheridge's week-long residency at Pizza Express promised "exceptionally special guests" from the guitarist's extraordinarily varied career. He started the week with a guest who certainly merited that billing, the classical guitarist John Williams. The contrasts between the two were many. Williams, quietly spoken, produced notes from his classical guitar that were oboe-like in sweetness and intensity. Etheridge was supremely laid-back, calling out to the audience for a file after he broke a nail, and cracking jokes about his sartorial deficiencies. But there was nothing lacking in his playing, in which his soaring improvisations were the perfect foil to Williams's more formal technique. Both played solo numbers, Etheridge dipping into the standards with "God Bless the Child" and Sonny Rollins's "Doxy" and Williams demonstrating his mastery of the Latin American classical canon. Music from Mali and Senegal flowed from their fingers when they joined each other, but in their own compositions, the combination moved to another level. Etheridge, who swapped between acoustic and electric guitars, laid down a series of arpeggios to introduce his "Strange Comforts", a tune that nicely unsettled the ear with its chord changes, and then let Williams take over harmonic duties, allowing him to solo more freely. They ended with a tour-de-force arrangement by Williams that pointed to the heights these two are likely to scale the longer they perform together; this was the first time they have paired up. Now called "Extra Time", the number was originally titled "8-4-7" in reference to the first three chords in Bach's C Minor Prelude. The two guitarists worked their way through the prelude's form, gradually developing it into their own. The last quarter, where bass notes anchor what I've always thought of as a recitative section (what jazzmen might call "the stops"), became a series of mini-cadenzas for Etheridge, before both, remaining true to Bach, brought it crashing to its magnificent conclusion. The pair moved on, first to a lyrical passage, and then to a long ostinato section that mesmerised the listener as the two wound the tension ever higher. No encore could quite follow such a finale. Anyway, as Williams explained, they had no more material: "That really is all we know," he apologised. They'll have more ready in time for a forthcoming US tour. 'I Didn't Know' (Dyad Records DY 024) Derek Ansell. Jazz Review Busy since the 1970s in various fusion bands and working regularly with Stephane Grappelli's touring group for many years, Etheridge has been very prominent in a number of musical environments. He was, for example, in The Soft Machine until the end of the 1970s. His jazz work has always featured solo spots both on record and live concerts but here, at last, he gets to do what he does best, a whole hour of diverse and fascinating solo guitar. On these strictly jazz interpretations he plays semi-acoustic guitar mainly but also a semi-bass, with lowered bass strings and fretless guitar for some introductions; there are very few overdubs. Etheridge plays strong, straight ahead, jazz on these pieces producing a big, full sound that makes it seem that there is more than one musician present throughout. Mercy, Mercy, Mercy works very well with a strong bass line accompaniment as he digs into the blues and improvises effectively on the Zawinul song made famous by Cannonball Adderley. On every selection here Etheridge makes a strong impression as both a blues based jazz guitarist and also as a soloist who can fill out bass and harmony parts without need of a rhythm accompaniment. God Bless the Child is sumptuously sculptured for solo guitar, the lines played recalling the best of versions by Billie Holiday and Sonny Rollins with Jim Hall. And yet Etheridge's blues tinged sound is uniquely his own, very full, very expressive and creating his own, personal jazz environment. His reading of the hackneyed My Romance is unlike any other jazz version I've heard and there have been a few! Mr. E has found his best method of self expression and should nurture and continue it. Meantime we have this comprehensive CD of his solo skills. JOHN ETHERIDGE QUARTET. Pizza Express, W1. **** (four stars) David Sinclair. The Times A man of many parts, the guitarist John Etheridge has journeyed from the furthest shores of jazz-rock fusion with 1970's pioneers Soft Machine to more recent collaborations with classical musicians such as Nigel Kennedy and John Williams. His ongoing group Zappatistas carries a torch for the tortuously intricate music of the late Frank Zappa. But it was the English veteran's own music which came under the spotlight on Thursday, as he reached the half-way point of an impressive seven-night stand at Soho's other ~jazz venue the increasingly popular Pizza Express. A gifted, but underrated composer, Etheridge has an ear for a tune that is matched by an abiding reluctance to state the obvious. On 'Stitched Up', a swift sortie with a mutant ragtime feel, his fingers dashed across the fretboard with a light, nimble feel. He prefaced 'Distant Voice' with the gentlest of finger-picked arpeggios before engaging in a gospel-tinged dialogue with Steve Lodder, who prodded away at an organ-sounding keyboard placed atop the venue's grand piano. And towards the end of 'Chips' a clunky, stuttering jazz-funk groove, Etheridge kicked a floor pedal and exploded into the sort of unruly fret-melting action which still lends this sort of music a mildly disreputable frisson. Drummer John Marshall (also an alumni of Soft Machine) and double bass player Jeff Clyne laid the rhythmic foundations with the poker-faced air of the hardened professionals that they are. But Etheridge played the role of front man and host with a genial, self deprecating manner that belied the thoughtful intensity of the performance itself. Having broken a string during a particularly ferocious bout of soloing in Miles Davis's 'All Blues', he maintained a wry running commentary while replacing it and re tuning his guitar - "You put on one new string, and the others all start sulking". The merriment among the crowd between numbers was balanced by the respectful hush which prevailed once the band resumed playing, and nevermore so than during a sensational reading of the title track of Etheridge's 1993 album 'Ash'. After a very last but silky-soft introduction, the number took off on a series of unexpected twists and turns that showed off the quartets exceptional gift for improvising as a unit to spectacular effect. As the number returned to its original theme by a route so circuitous that the musicians themselves seemed surprised to have discovered it, even the imperturbable Marshall cracked a smile. 'I Didn't Know' album launch. Pizza Express, London. WI Alyn Shipton. The Times The idea of a guitarist playing entirely unaccompanied for an entire evening is not new. It conjures up the svelte sounds of the late Barney Kessel, the acoustic wizardry of Charlie Byrd, or the urbane perfectionism of Britain's own Martin Taylor. Any rough edges are planed off, and the aim is to dazzle the audience with technical brilliance immaculately showcased. Such an approach would not sit well with the wide ranging musical interests of John Etheridge, a veteran of such diverse environments as the Stephane Grappelli Quintet on the one hand, and Soft Machine on the other, whose current bands include everything from an acoustic quartet to an extrovert Frank Zappa tribute package. Etheridge's playing is no less technically brilliant than those other players, but he adds a harder edge to his music, and he is prepared to take greater risks in order to aim for more excitement and rhythmic variety. Playing a solo evening at the Dean Street jazz room to launch his new album 'I Didn't Know', Etheridge proved from the outset that he can keep all the grit and excitement of his band-playing intact, even with in a solo contexL. His striking melodic lines and deftly shifting chords jumped out of the opening 'Little Willie Leaps', which set a high standard for the evening. Maybe it's because he is right in the middle of a short national tour with the classical guitarist John Williams, exploring music from Africa that Etheridge's two African numbers were the most memorable. 'Guitar Makossa' by Francis Bebey caught the gentle rolling rhythms of African dance music, with a joyous township melody superimposed on top, and an anonymous Madagascan piece developed the mood with a particularly hypnotic bass line. But when it came to bass lines Etheridge was on inventive form instrumentally, having added bass guitar strings to the lower end of his Fender Telecaster, giving a huge depth to his sound, and allowing him to give the impression on 'Lullaby of Birdland' that an invisible bassist was accompanying him. There were more surprises, too, notably a fretless Guild guitar that ushered in the title track of the new album with a twangy, plangent tone, and a Yamaha electric beast that gave a fair impression of Jimi Hendrix in his pomp. When someone requested Happy Birthday, they probably weren't expecting a Hendrix style rendition, complete with a wall of psychedelic noise that was the very antithesis of the suave nightclub solo guitarist. On this form, I recommend catching Etheridge when he returns to the club for a week in August. Pizza Express, London John Fordham, The Guardian. Monday June 21, 2004 With his distracted, Tommy Cooper-like cackle and air of embarrassed amateurism, John Etheridge likes to give the impression he has no idea what he's doing. But there's never a moment's doubt about his awesome authority whenever he touches a guitar. The London-born guitarist gave himself the taxing task of a solo show aided by nothing more than a choice of instruments and a little technology to launch his new album, 'I Didn't Know'. Etheridge has an immense breadth of musical interests. This has allowed him to work with the pioneering British crossover band Soft Machine, with the violin virtuoso Stephane Grappelli, as the core of the highly creative Frank Zappa tribute band, Zappatistas, and sometimes with the classical guitarist John Williams. Etheridge, in jazz guitar mode, opened with Charlie Parker and then a subtle account of Charles Mingus's Goodbye Pork Pie Hat. Then he relaxed into the Cameroonian groover Guitar Makossa (duetting with his own sampled rhythm part) and a sensuous Madagascan dance tune that sounded at times like a 1950s rock ballad. He then explored a tone-poem of long echoing sounds and spacey effects, eased into a melody that wandered between 'Sometimes I Feel Like a Motherless Child' and 'Summertime', before becoming 'Swing Low Sweet Chariot' - the latter a gem of choir-like sound effects, busy low counterpoint and rich chords. A stomping bassline under 'Lullaby of Birdland' drove a sharp, high-register improvisation, and a churning, Hendrix-like account of 'Happy Birthday' for an audience member rocketed off into a whirlwind of abstract sound, then a brief boogie, a clamour of bell-like sounds, and an abrupt dead halt. A master-of-all-genres guitarist at work, even if he does his best to hide it. Finger pickin' good Pizza Express Jazz Club, London W1 Stuart Nicholson, The Observer. Sunday June 20, 2004 Filling in the blanks of guitarist John Etheridge's career between a stint in the 1970s with rock band Soft Machine to his current duet project with fellow guitarist John Williams would take a piece of closely written A4. But it's safe to say he'd never played a solo concert until premiering his latest album, 'I Didn't Know'. more He's been there, done that so many times during his career that he even dug out one of the T-shirts for the show. Armed only with five guitars, from a Fender to a fretless, and a suitcase-sized amp, he fearlessly set about masterfully deconstructing an eclectic range of songs. A dazzling look-at-me introduction acted as calling card and CV, saying everything you needed to know about John Etheridge - here was a master guitarist at work. Cognisant of many styles and able to dip in and out at will, Etheridge avoided nailing all his colours to one stylistic mast alone. From Charlie Parker's 'Now's the Time' to 'My Romance', a standard associated with pianist Bill Evans, to Charlie Mingus's 'Goodbye Pork Pie Hat,' he made them all his own. Even the spiritual 'Swing Low' took on a new glow, but unlike the English rugby team you knew the wheels were never going to come off Etheridge's chariot. A player capable of creating the elegant and the profound, he settled for the former, even on a spontaneous piece of rock impressionism of a sleepless night. 'I Didn't Know' - CD ***** (five stars) Peter Bacon. Birmingham Post. July 17, 2004 He plays Frank Zappa's music, he plays Django Reinbardt's, he can coax the gentlest melody in harmonics from an acoustic guitar, and he can out-rage the wildest heavy rocker. John Ethendge has to be the complete guitanst. This is a solo album and mostly there is just one guitar - there are minimal overdubs from time to time. more The material ranges from an Arican groove like 'Guitar Makossa' to Billie Holiday's 'God Bless The Child', from John Scofield's 'I'll Take Les' to Charlie Parker's 'Now's The Time', and from Jerome Kern's 'Can't Help Lovin Dat Man' to the traditional Swing of 'Low Sweet Chariott'. On the Scofield tune he plays both lead lines and bass by lowerng some of the strings on his Fender Telecaster. While this disc may give other guitarists reason to weep, the rest of us can luxuriate in the outstanding musicianship and more importantly, the emotional warmth that Etheridge brings to anything he plays. Technical brilliance but never for its own sake, always in the service of the music. And even more brilliant for it. 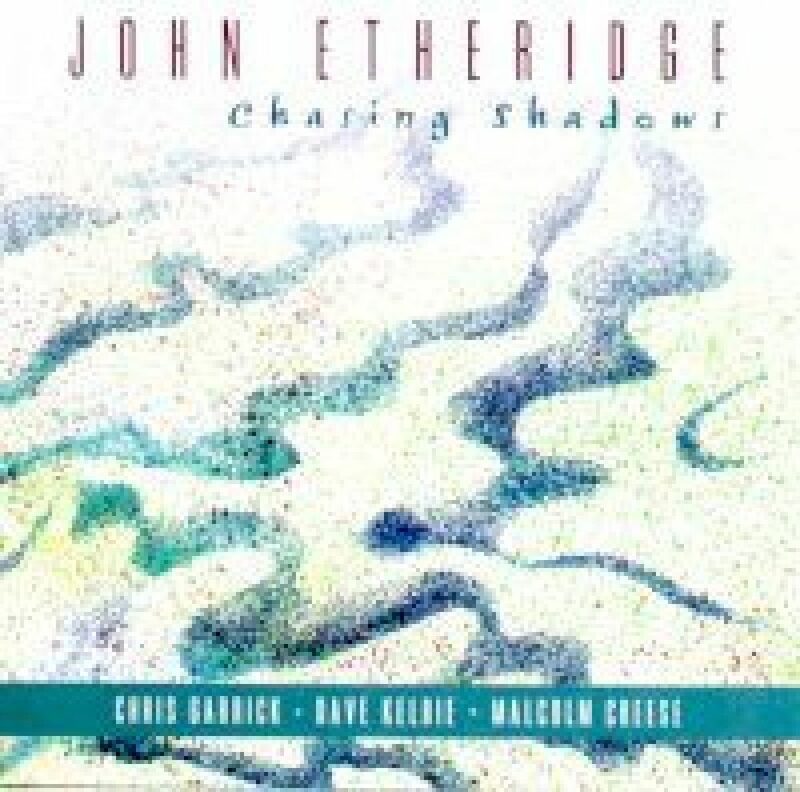 "John Etheridge is one of our unsung national treasures – a man with staggering technical prowess but who understands that that prowess is nothing without the heart and soul which turns the notes into music" Peter Bacon - Birmingham Post, Jazz CD of the Week: Chasing Shadows. 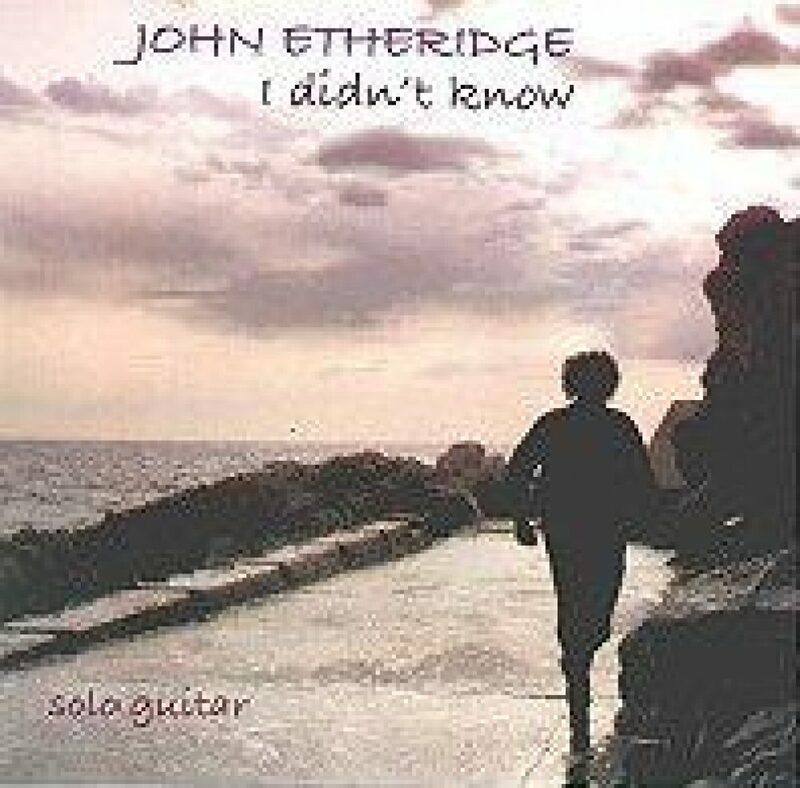 "If John Etheridge weren't so brilliant he might be more famous. His versatility is confusing. What other guitarist could have begun his career as a member of Soft Machine and the Stephan Grappelli Quintet? For this set Etheridge revisits Grappelli territory, but in the spirit of exploration rather than nostalgia. His companionns are rhythm guitarist Dave Kelbie, bassist Malcolm Creese and Christian Garrick, the best young violinist in jazz today. The programme ranges from old ballads, such as 'I'm Through With Love', to a death defying version of Coltrane's 'Giant Steps' that would cause other guitarists to fall apart from the first chorus." Dave Gelly - The Observer, CD Of The Week.